Time Travel: Visiting Hoover Dam | Broadview Collaborative, Inc.
out for a day’s adventure in the American west. No matter what your opinion of dams, you can’t ignore the engineering marvel that Hoover Dam is. I swear that half of the people on my tour (and I highly recommend taking the Power Plant Tour if you visit) were civil engineers and the other half were their wives (very traditional group). I was simply a rounding error, a little cayenne in the casserole. 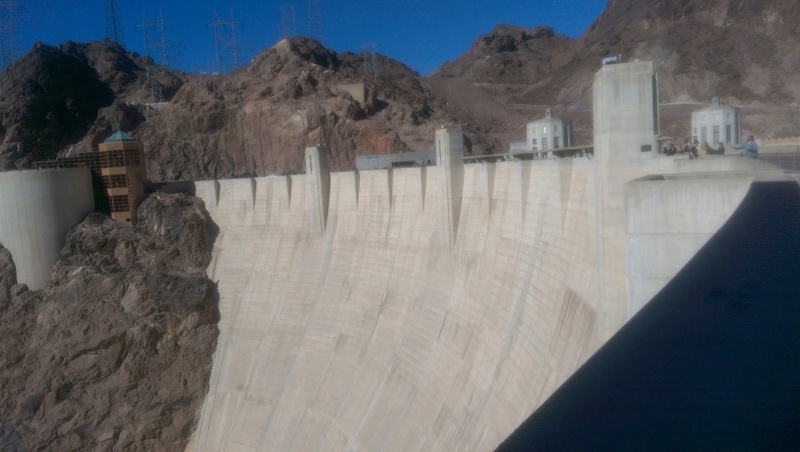 This dam, which started life as “Boulder Dam“, employed a crew of 3,000 people working in three shifts around the clock, seven days per week with only two days off per year to move and shape 3.25 million cubic yards of concrete into what we now know as “Hoover Dam”. Material came from all 48 states (this was before Hawaii and Alaska joined the union). The dam tapers from 660 feet thick at its base to 45 feet thick at the top, which supports a road and sidewalks running across it. And get this: there is no rebar or other reinforcement in the entire dam – it’s all concrete. It wasn’t just the civil engineers who found it fascinating to hear that the concrete is, after nearly 80 years, still curing and getting stronger each year. According to our Bureau of Reclamation guide, the condition of the concrete is very actively monitored, but no new stress fractures have been found since 1943. (I wish the same could be said of my house!) In addition to creating the massive reservoir, the dam is home to a daunting power plant, capturing energy as the water flows past the dam and converting it to electricity for Nevada and Arizona. I wondered if any of my fellow tourists noticed my pride when our guide pointed out that much of the internal workings of the power plant were manufactured in Milwaukee in the 1930’s (probably in the Menomonee Valley) and are still operating. Not wanting to be too pesky, I tried very hard to keep my curiosity in check, and hoped that others would ask some of the same questions I had. Fortunately one person asked about the very obvious white rim coating the rocks around the edge of Lake Mead. Our visit, on November 4th, 2014, was well into a regional drought which many were saying was partly due to climate change, but the guide literally took a “half full” approach to the question. I guess it’s a matter of perspective, but I was surprised to hear him say that the ring was calcium carbonate “left behind from flood times”. I followed up with a question about predictions about future flows into the reservoir to which the guide confidently replied “As long as there is snow in the Rockies, we’ll be okay.” I wish I could have shared his confidence about those prospects. Later in the tour I asked about the location of Southern Nevada Water Authority’s intake pipes, including the new one that is considerably lower (deeper) than the other two. The answer? “I don’t know. Las Vegas isn’t my problem.” Right. He’s there to tell us about the dam and the power plant, not the water. Plus, he added, “I live in Boulder City [which promotes itself as a ‘clean, green oasis in the desert’] and we have our own straw.” As if to confirm his point, I remembered passing the Bureau of Reclamation’s regional headquarters in Boulder City earlier that day and couldn’t help but notice its estate-like green lawn. 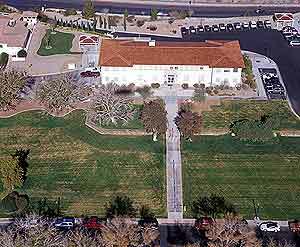 It may be in a desert, but at least one federal agency feels as though there is plenty of water for all, including blades of grass. After the tour ended we were free to wander about on our own, seeing the alarmingly low water levels, stranded spillways, and a small pier looking very out of place along the rock face. Naturally, I checked out the toilets and found conventional plumbing, probably flushing 1.6 gallons hundreds of times per day. 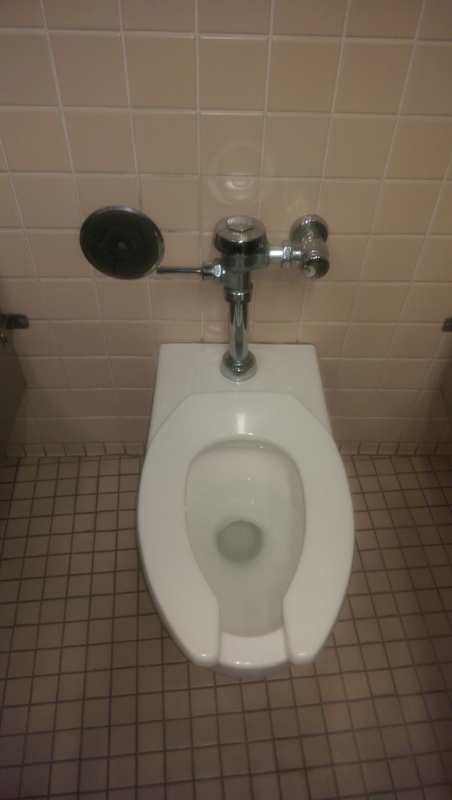 Though I don’t have a picture to show it, the National Park Service offices a few miles away had very high efficiency toilets in their visitors center and desert landscaping throughout. Clearly not all federal agencies approach water in the same way, but that’s another story for another day. The biggest shock came when I sat down to listen to the narrated story of the Colorado River. 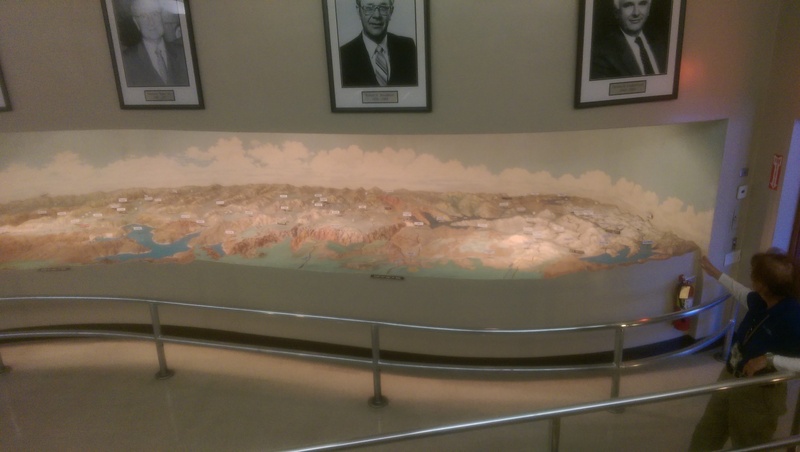 Visitors can rest their feet for a few minutes in the Old Exhibit Hall and hear the “history of the river from beginning to end” while watching it play out on a a scaled topographical model of the watershed. Most people skip this part of the tour because it is clearly dated, and by this point in time people are tired. But I shuffled in along with two others, thinking I might get to take a quick nap while the lights were dimmed. Ha! I was quickly jolted awake by what I heard. We were indeed getting the history, but unfortunately it hadn’t been updated since 1946. All in a voice that sounded just like Edward R. Murrow, we learned of the “threat and devastation (of the river) now harnessed to serve mankind”, the “unruly” and “unpredictable” river that had now been tamed to “create fertile grounds”, and that the dam was the “only solution” to end periods of drought and flooding. Imagine the shock of signing up for a geology course and finding out that the professor was using 70-year old textbook. It’s sort of the same thing. The world has moved on since 1946, but a visit to Hoover Dam is still like going to school with granddad. 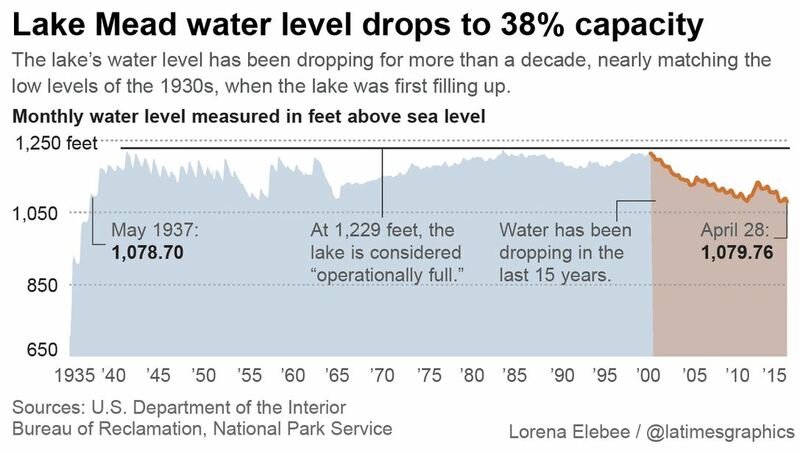 Today, four months and one rainy season later, headlines read that Lake Mead water levels are at the lowest they’ve been since 1937. Water continues to be used and to evaporate, and lake levels continue to drop at roughly one foot per day. By my calculation, one of Southern Nevada Water Authority’s (i.e. Las Vegas’) intake points will be stranded above the water line in as little as a month. Yet demographers continue to predict that Las Vegas’ population will double by 2060, but I wonder. In seventy years, will that narrative sound dated too? Love a healthy dose of cayenne in my casserole any day!